The free birthday invitation maker that lets you concentrate on having fun. Online birthday invitations from Smilebox are convenient and fast to create, yet convey all the great looks and emotions that are part of every important event. Our birthday invitation maker comes complete with a wide array of beautifully designed templates. Each online birthday invitation design can be customized with your photos and the message that you want to send. 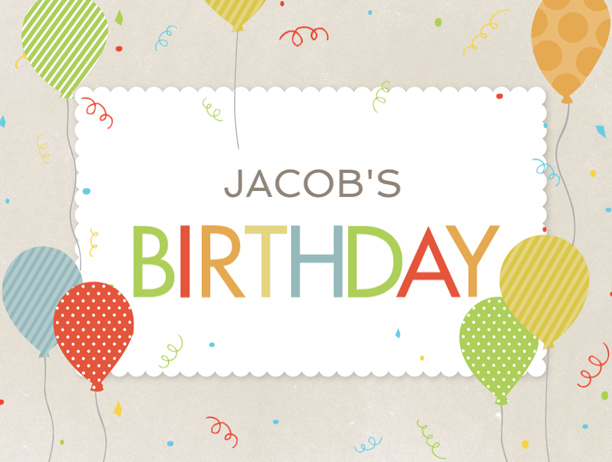 Lastly, Smilebox online birthday invitations are easily shared in a number of user-friendly ways. Once you have completed designing your online birthday invitation, it’s time to share it with family and friends. Smilebox gives you lots of sending options, including email and posting to social media, so those who can’t attend still get a keepsake. For a more permanent memento, our birthday invitation maker allows you to save the invitation to your computer or print it. This can be put in a place of honor at home, mailed to loved ones, and included in grab bags for friends to take with them. Smilebox delivers all these features and more – keep reading to discover the ease of using our free birthday invitation maker. Our birthday invitation maker is loaded with fun designs. Find the one that appeals to you the most, click it, and then on “Personalize”. For the past year, or over many years, you’ve been taking photos of the birthday boy or girl. Now it’s time to use the best of the bunch for the invitation. Smilebox online birthday invitation maker lets you select a photo from your computer, phone, or social media account – just click “Add More Photos”. Smilebox has loads of customization options for color, text, fonts, and music. Decorate the online birthday invitation with your kid’s favorite colors, change the text with the details of the party, and make any final artistic adjustments. You can always experiment by combining different selections, which change the online birthday invitation template instantly. After inspecting the final version of your online birthday invitation with the “Preview” feature, you can share it with birthday party guests and loved ones everywhere. Simply email the online birthday invitation to friends or post it on your social media account. If you prefer a more formal approach, print and mail it to your guests. Kids will love the online birthday invitations you create. In fact, the Smilebox birthday invitation maker is so simple to use, why not let your son or daughter take part? You can let them choose their favorite photo to be included with the online birthday invitation, and then help them type in the text. Making an online birthday invitation can be an opportunity for bonding! Online birthday invitations aren’t just for kids! You can customize the Smilebox birthday invitation maker for essentially anyone, from babies to grandparents. Even if a party isn’t planned, just sending an online birthday invitation is a great way to mark the day. Smilebox birthday invitation maker allows you to create an online birthday invitation in a jiffy, in case you don’t have a spare minute. Our platform is designed for ease of use so that designing an online birthday invitation is intuitive. This means that you can finish making and sending invitations quickly, and have more time to prepare for and enjoy the occasion. But you might just find that creating an online birthday invitation is entertaining in itself. With all the colors, text, and fonts for you to change, customizing the free birthday invitation is an activity to enjoy. But don’t forget about the party!